Choice from above with string beans. bamboo shoots and chili simmered in Thai green curry and coconut. Choice from above with potatoes in karee curry and coconut milk. Choice from above sauteed with celery, onions, water chestnuts and cashew nuts in a mild sauce. Choice from above sauteed with cucumber, pineapple, tomatoes and onions. 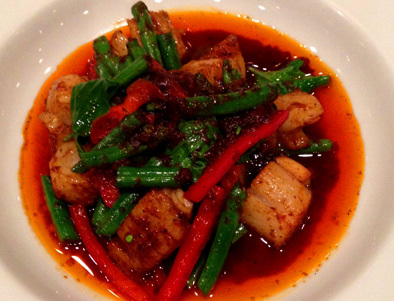 Choice from above sauteed with basil leaves, chili, and string beans. Choice from above sauteed with Chinese broccoli. 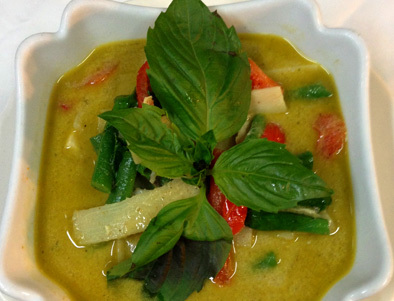 Choice from above sauteed in basil curry with basil leaves. Choice from above sauteed with mixed vegetables. Crispy whole red snapper or salmon fillet topped with spicy chili-basil sauce. Steamed whole red snapper or salmon fillet with vegetables, ginger, and scallions. Crispy whole red snapper or salmon fillet topped with fried garlic. 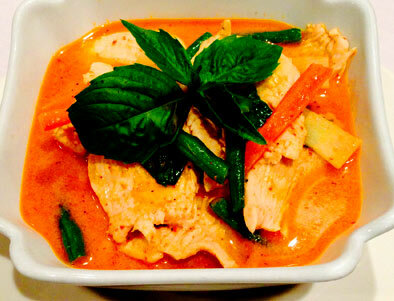 Crispy whole red snapper or salmon fillet topped with Thai red curry. Crispy frog’s legs topped with garlic and pepper sauce. Pan fried frog’s legs with chili peppers and fresh basil. Braised frog’s legs topped with Thai red curry, chili pepper and fresh basil. 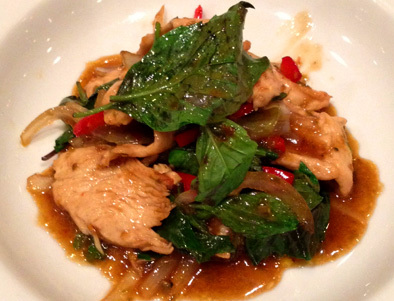 Topped with spicy chili-basil sauce, pepper, fresh basil. In coconut milk with Panang curry sauce. In coconut milk with Thai red curry sauce with pineapple, tomatoes and pepper.